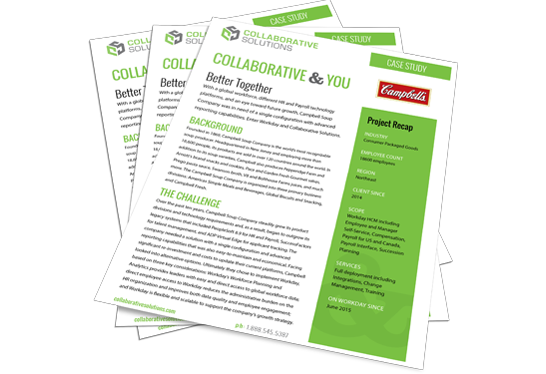 With a global workforce, different HR and Payroll technology platforms, and an eye toward future growth, Campbell Soup Company was in need of a single configuration with advanced reporting capabilities. Enter Workday and Collaborative Solutions. Founded in 1869, Campbell Soup Company is the world’s most recognizable soup producer. Headquartered in New Jersey and employing more than 18,600 people, its products are sold in over 120 countries around the world. In addition to its soup varieties, Campbell also produces Pepperidge Farm and Arnott’s brand snacks and cookies, Pace and Garden Fresh Gourmet salsas, Prego pasta sauce, Swanson broth, V8 and Bolthouse Farms juices, and much more. The Campbell Soup Company is organized into three primary business divisions: Americas Simple Meals and Beverages, Global Biscuits and Snacking, and Campbell Fresh. Over the past ten years, Campbell Soup Company steadily grew its product divisions and technology requirements and, as a result, began to outgrow its legacy systems that included PeopleSoft 8.9 for HR and Payroll, SuccessFactors for talent management, and ADP Virtual Edge for applicant tracking. The company needed a solution with a single configuration and advanced reporting capabilities that was also easy-to-maintain and economical. Facing significant re-investment and costs to update their current platforms, Campbell looked into alternative options. Ultimately they chose to implement Workday, based on three key considerations: Workday’s Workforce Planning and Analytics provides leaders with easy and direct access to global workforce data; direct employee access to Workday reduces the administrative burden on the HR organization and improves both data quality and employee engagement; and Workday is flexible and scalable to support the company’s growth strategy. Collaborative Solutions implemented the Campbell Workday solution in a two-phase project that kicked off in May 2014. Phase 1 encompassed Workday HCM, including Employee and Manager Self-Service, Compensation, Payroll for US and Canada, Payroll Interface, and Career Profiles, and went live on-time and on-budget in late June 2015. Phase 2 went live in December 2015 and included Absence Management, Recruiting, Performance Management, and Talent, including Succession Planning. Campbell and Collaborative partnered together on a comprehensive Change Management & Training program to develop a global transformation strategy. This comprehensive strategy included a multi-tiered global change network, executive stakeholder management, differentiated training programs and materials, and thorough communication throughout the process. Through the identification of targeted communication and training needs, confirmation of new role expectations, and deep focus on user experience, Campbell’s change management team was able to drive engagement and support for their transformation throughout the organization. Collaborative Solutions deployed Workday in 15 countries Campbell operates in, including Australia, Canada, China, Hong Kong, Indonesia, Japan, Malaysia, Mexico, New Zealand, and the United States. The move to Workday’s integrated HR system was a successful one, allowing Campbell Soup Company to develop a stronger set of HR capabilities in key areas, deliver enhanced reporting and analytics for all user levels, rationalize and simplify HR business processes through the adoption of leading practices, and provide a consumer-grade user interface and intuitive access to information and transactions. In addition, the project retired legacy custom solutions, implemented frequent lower-risk, incremental updates and eliminated high-risk, expensive, infrequent upgrades. Campbell now realizes savings through the reduction of administration time and expense for many HR processes and the simplified management of its US Paid Time Off policy, as well as improved cost visibility through subscription-based pricing. In addition, thanks to the efforts of the combined Change Management team, Campbell Soup Company achieved success in the adoption of the Workday suite across its global enterprise and launched new HR Shared Services teams in the Americas and Asia-Pacific regions to manage its HR functions.